Repurpose's schoolbags are more than a way for students to schlep books. 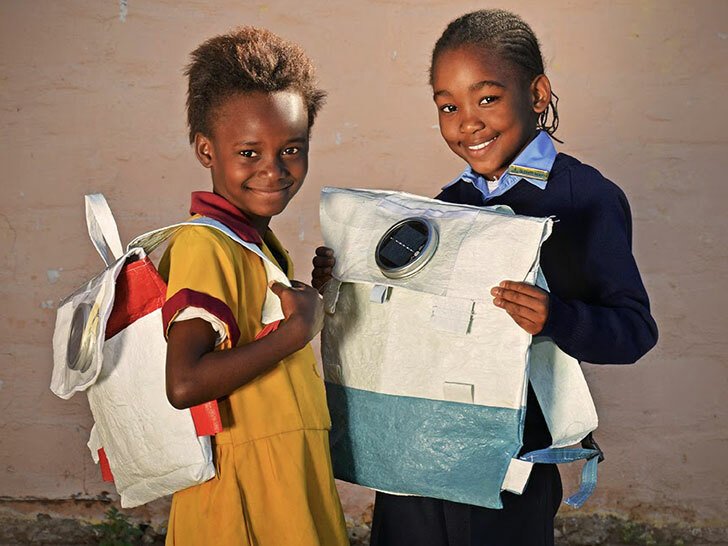 Designed with underprivileged South African schoolchildren in mind, the backpacks feature a rechargeable solar panel that transforms into a "homework lantern" after sundown. 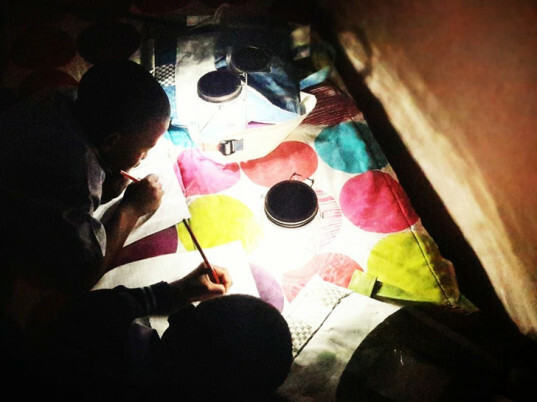 Thato Kgatlhanye and Rea Ngwane of Rethaka, the Rustenburg-based firm behind the carryalls, believe that children should focus on their sums, rather than the cost of purchasing kerosene and candles. Crafted from 100 percent recycled plastic shoppers, the bags cost the environment very little, as well. "We remove complexity and embrace necessity by recycling plastic shopping bags into a textile," Kgatlhanye and Ngwane write on their website. "We believe our plastic textile is a practical solution to the plastic pollution crisis." Another upside of using plastic? The bags are waterproof. (“There’s nothing worse than wet books,” notes the duo.) And since aesthetics played a huge role from the beginning, the backpacks are both colorful and appealing. Repurpose spared little detail, either. Each bag includes strips of retro-reflective material, improving its wearer’s visibility and safety while walking. Rethaka makes it clear that it’s a for-profit business, not a charity. The bags themselves sell for 250 South African Rand ($21) apiece, but Kgatlhanye and Ngwane also seek out “giving partners,” such as Red Bull, SAB Foundation, and Standard Bank, to sponsor disadvantaged schools. In addition, Repurpose runs “PurposeTextile” bins, set up at local schools, churches, and businesses, to collect plastic for upcycling. Not only do they create a supply of materials for the company to work with, but they also encourage students to pick up litter around their communities. “We bank on the environment because our future leaders need us to,” Kgatlhanye and Ngwane explain. And since aesthetics played a huge role from the beginning, the backpacks are both colorful and appealing. Each bag includes strips of retro-reflective material, improving its wearer's visibility and safety while walking. Even the brand's patchwork band has a purpose behind it. "One of our seamstresses, Pauline, ingeniously came up with this signature band made of all our offcuts," say Kgatlhanye and Ngwane. "She says she was inspired by how everything and everyone has a purpose and therefore valuable." The bags themselves sell for 250 South African Rand ($21) apiece, but Kgatlhanye and Ngwane also seek out "giving partners," such as Red Bull, SAB Foundation, and Standard Bank, to sponsor disadvantaged schools.